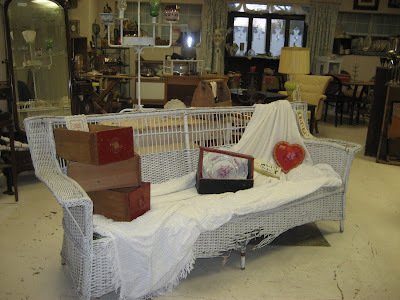 We pulled this wicker sofa up front. While it has seen some use, it is still a beauty. 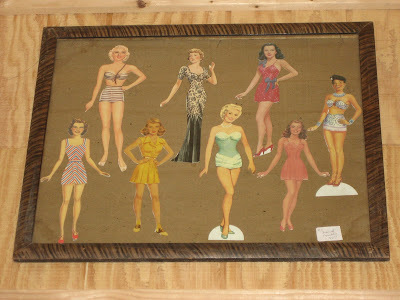 Kathie brought these framed dress up dolls. They are pristine and I love 'em! Remember the plates I mentioned? Kathie put them in this chicken feeder. I can't tell you how much I love this idea! 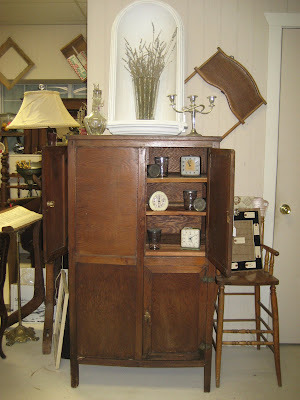 This cabinet is still under construction, but, check out the stacked glass doorknobs, top shelf, either side. I think it's a cool look. 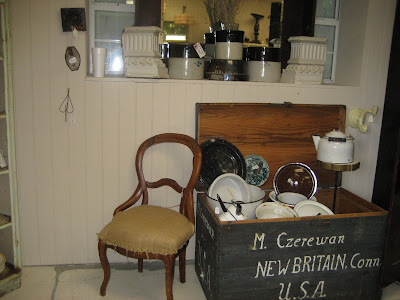 We've got crocks and enamel ware. What's your pleasure? We moved this piece up against the wall and placed my Friday Find, the white wall niche up top (the niche is sold). The three clocks you see in the cabinet? Someone saw them on flickr and emailed me. Sold! I'll be shipping them out this week. You, too, can check out the flickr pics on the left of my blog, and give me a holler. David and I are heading back to Primitiques after church to finish up. I am excited about the changes made and the new stuff put out. Come and get it! 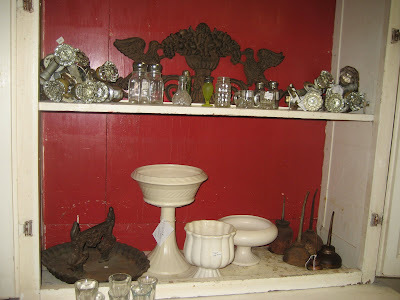 Changes look good, be sure and take more pics of shop when you are finished! Okie, dokie...you have talked me into it! I have got to schedule a visit to your shop! Everything looks great! I need to get Trash Talk's FiFi dog to her anyway, so I will see you sometime in the next couple of months! Still love your duck...when I come into moeny I'll be up! And, of course, the cowboy boots and stirrup! Love the dishes in the chicken feeder! Too clever! It's lookin' good! I would love to come and poke around your shop. I'm sure it would be one of my favorite places! Everything looks beautiful. Wow I just love how everything looks. You have NO idea how bad we need to work on our two booths. I feel ashamed in a way we haven't take care of them like we used to but just haven't had tons of time. We got our check the beginning of this month and we were really expecting to have to pay, we were tickled to see we had a pretty good month. Sold a primitive cabinet we'd had for 3 or 4 years so that was a big woooohooo! Now we need to get on the ball searching for more goodies, if there is ever enough time in the day again for that fun sort of thing. Have a great evening, we're just having a boring evening sitting here in the hospital room but thank the good Lord Molly is getting better so I am not going to complain. 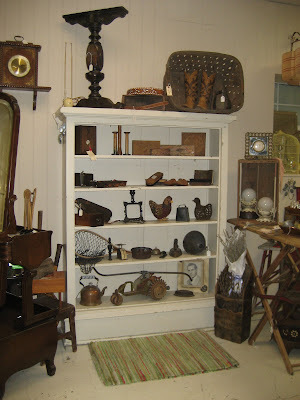 I went to your shop on thursday, and it was very interesting, now It looks totaly different! I met up with Tony, and we visited your shop. I liked the big fluffy and friendly cat! You have some wonderful things and the pink door is talking to me. 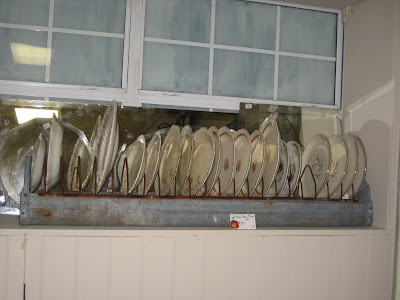 Love the dish rack...great idea. And the doorknobs are cool, too. I love glass doorknobs. You might have guessed as my house has all glass doorknobs. Wonderful changes, Mindy! Kathie nailed it with the chicken feeder plate holder. You guys do good work. How great is this forum for business! My preference between enamleware and crocks - both! Cher, I thought of you as we were placing those! Tracy, the booths will be there when you get back. I hope Molly is having a good day.